The Scoville unit was named for Wilbur Scoville in 1912. At the time, he worked for a pharmaceutical company named Parke-Davis where he developed a test called the "Scoville Organoleptic Test" which is used to measure a chili pepper's heat. Originally, Scoville ground up peppers and mixed them with sugar water, then test them with a panel of tasters who sipped from these sugar-water-pepper solutions. He would then dilute the solutions bit by bit until they no longer burned the tongues of the tasters, after which he would assign a number to the pepper based on the number of dilutions needed to kill the heat. The measurements are divided into multiples of 100. Note that 1 part per 1,000,000 dilutions of water is rated at 1.5 Scoville Units. Pure capsaicin, the stuff that makes chili peppers hot, is rated between 15 - 16,000,000 Scoville units. This is incredibly HOT! See the chart below to compare several peppers on the range of the scale, and how they relate to pure capsaicin. Today, testing chili pepper heat is not quite so subjective. It has been replaced by High Performance Liquid Chromatography, or HPLC, which measures the pepper's heat producing chemicals and rates them in ASTA pungency units. 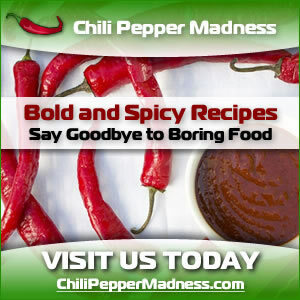 Learn More About the Scoville Scale Here at Chili Pepper Madness. Also See: What are the hottest chili peppers in the world?